Rumors are flying that former Alaska governor and failed vice presidential candidate Sarah Palin is currently in talks with President-elect Donald Trump's transition team about a possible cabinet appointment which would put Palin as the next secretary of veterans affairs. Both ABC News and NBC are citing unnamed "sources" close to the Palin and Trump campaigns, who claim that Palin reached out to the incoming administration, offering to use "the megaphone I have been provided... in a productive and positive way to help those desperately in need," according to NBC's source. But Palin's potential appointment — which, if formalized, would then be subject to approval next year in the Republican-controlled Senate — is already causing controversy for several reasons. Not the least of these is that if confirmed, Palin would be the first VA secretary in American history who has never served in the U.S. Armed Forces, according to Washington Post military writer Dan Lamothe. And while that distinction does hew closely to Trump's various campaign promises to shake up the "business as usual" politics of Washington, Palin is by no means a political outsider, and more importantly, has almost no professional history demonstrating a commitment to protecting the rights of veterans. The Department of Veterans Affairs is the federal government's largest agency, serving an estimated 21.8 million veterans. It oversees the nation's sprawling network of VA hospitals, and is responsible for issuing financial, healthcare, and other benefits to which veterans are entitled under U.S. law. It's a rare point of bipartisan agreement that the VA is in need of attention and reform to best serve those who served in uniform. Throughout her political and reality television career, Palin has often referenced her "support for the troops." The same day news broke about her potential cabinet appointment, her son-in-law (Medal of Honor recipient Dakota Meyer) posted a video to her Facebook page touting the half-term governor's dedication to America's servicemen and women. ABC News notes that the video, produced for Palin's political action committee, SarahPAC, "is not new," but adds fuel to the fires of speculation about a possible cabinet position. "We should be grateful we'll soon have a commander-in-chief who will champion our vets and honor the promises our nation made," Palin wrote on her own page when sharing Meyer's video. 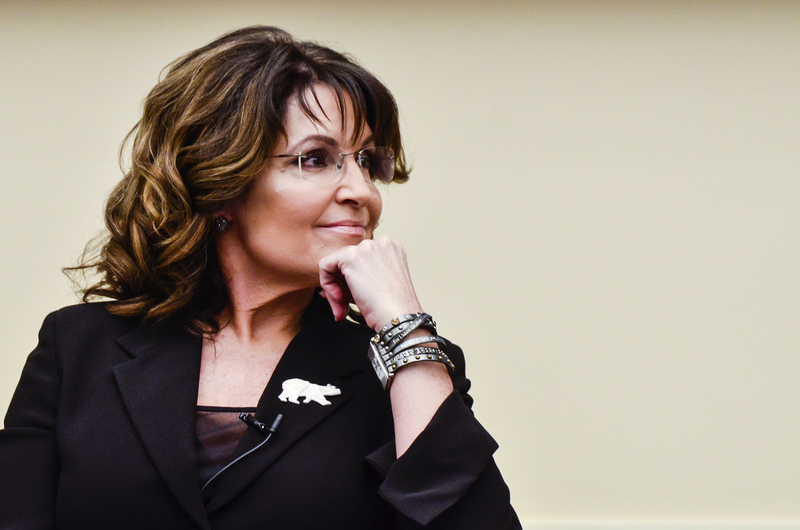 Palin often speaks about the military in personal terms, though she herself has never served. Her eldest son Track is an Army veteran who deployed to Iraq in 2008. Track was arrested in January in connection with an alleged instance of domestic violence. (The charges were later dropped by the state as part of a plea deal which saw Track pleading guilty to a weapons charge.) In defending her son to members of the media, Palin suggested that his combat tour in Iraq had contributed to post-traumatic stress disorder, of which the alleged abuse was a "ramification." Speaking at a Trump rally in Oklahoma in January, where she endorsed the future president-elect just hours after her son was arrested, Palin added that such "ramifications" of PTSD were worsened by President Obama's alleged lack of care for the struggles veterans and military families face. Veterans from numerous wars were quick to challenge Palin's implication that combat-induced PTSD makes veterans more prone to violence (domestic or otherwise). Aside from that controversy and her stated affinity for "the troops," Palin's resume is all but void of any direct action she has spearheaded to improve conditions for America's veterans. Even self-proclaimed Trump supporters seem to be incredulous about Palin's qualifications, with many people noting that since the future commander-in-chief has never served in uniform, they were hopeful that someone with personal experience navigating the VA would be tapped to lead the agency.